Of course, I watched your YT channel. You know, I'm not skilled in music editing, I must learn from zero, I watched your tutorial & I got rby import but I never tried to use it on my rom because I don't know how to assign to a map a specific music different from the original, so I could also put in new music instead of only replacing it. Of course, some of that will be replaced (such as Intro at pokemon Logo & champion), but I need also to add some new ones (Printer Error, Pikachu Surfing, etc.). Unfortunately I never made whole new soundtracks, that's one of the reasons why I haven't done it yet, but I'll do it. You could go for studying the basics of assembly though. It should be rather easy creating scripts such as the following with assembly. if Yes --> displaytext "You chose Yes." Sawakita listed some handy tutorials in Gen I section. You've probably noticed them already but just saying. I learnt only GBA scripting (and I was enough able to create new special events) but I don't know very much of GB scripting, yup, I downloaded all sorts of asm tutorials & I'll watch 'em when my school is finished (infact I'm posting less than before, tomorrow it's holiday for us in my country so I got only a bit of time). If I haven't understood bad, disassembly shows all the script commands used in game. but I'll need free space if I add new commands, just like R\S\E ? I also don't know how to edit existing songs. I make my music in FamiTracker, as described in my tutorial. Just use an older version of FamiTracker, set the style to ""Old Style (Bend Up)"", make the instruments of the sounds that you want. Don't use any other effects than Volume and Duty. Set the volume to something like "15 13 11", set the duty to 0, 1, 2 or 3. You can control the volume exactly by placing Hex values next to the Notes-Instruments-. There is no built-in scripting engine in R/B/Y so everything in them works with assembly (actually, it goes like this with any other game as well but yeah...). That kind of there is basically build with calling several different functions; one for making the talked-to person event faceplayer (maybe by giving it the person event number as parameter while at it). Displaying text probably works so that you push a certain register which holds the pointer to the text data to stack along with some other register as rom bank of the text data and again, call some function that displays the text. Putting up YES/NO box also works by calling a function which does that, etc. You don't have to understand much about assembly to be able to work out with these, knowing where the functions are pretty much does all you need. So, you can simply check how some original people events' "scripts" work with an assembly editor / debugger, and write notes about the functions and their locations inside rom (many are probably in rom bank 0). Also like I mentioned, Sawakita has documented some of these already. And when you have time, I'd advise you to take a look at my video tutorials there (mainly parts 6 and 7). call, YesorNo ; waits for player to choose Yes/No. Sets z flag if player chooses Yes, otherwise, resets z flag. jp z, ChoseYes ; jumps to address "ChoseYes" if player chose Yes during "YesorNo" routine call. Inside the rom you actually see everything being written with numbers, like you've probably gotten used to. So instead of having "printText" stand for the address where the routine is located which can be used to print text data, you could instead see: 0x70A2. Yes, of course I know hex... otherwise I would have continued hacking only generation III. The fact is that I manly worked only with hex editor & I never used disassembling before (simply because I didn't knew its existence...), I'll give a look to those tutorials when I won't be so busy. Now, somebody knows where are located the tables that indicates of which sprite corresponds each trainer? Because, as I asked 1 page ago, I wanted re-add the Chief trainer class and assign to it its new sprite (page 4, the guy with red hair, red suit, black damageproof vest & a white Epsilon painted on it) without replacing any other. The problem is a bit more different than usual cuz I applied Danny E-33's graphic patch, which palettes should I use to give him similar color as much as possible? PS: I want add his sprite without replacing anyone's else sprite. Is it ok if I'll put in my hack a key character that speaks Filipino? Of course! If you want some help about our language just tell us. yes, because I discovered that google translater doesn't works good. The guy that would speak Filipino is the Pokemon Ranger (he's the same function of Mr.Slowpoke of Fuchsia City, the Safari Guardian). Well, instead of gold theeth, you'll need a vocal translater that translates from Filipino to english, because the Ranger in the story of my hack is Filipino. When you'll find him, he'll speak in filipino, and, of course, most of the players won't understand, so you'll need a translater to understand his words. You'll discover that he congratulates with you for many reasons that happens in the story and want give you HM04 instead of the translater, because usually his house is visited by foreign tourists from all the world and most of the times they don't understand. You exchange the 2 objects and now you'll be able to hear (or better, read) his translation. Well, I need a first phrase in filipino where he says something like "welcome! finally a famous trainer here! Oh, do you speak filipino?" then appears yes\no box but it doesn't matter what you choose because Grape doesn't speak filipino (Region of Frejo is west-europe-like), and then an answer by him (you feel free to adapt that phrase to be more elegant or educate, of course!). That is what I need, it would be nice see something in my hack, wouldn't it? I will translate it to you. Tuloy ka! Sa wakas isang sikat na treynor! Oh nagsasalita ka ba ng Tagalog? syempre! Pwede mong isama sa nalalaman mo ang mga katagang iyon para maging edukado at elegante ka. "Maligayang pagdating! Sa wakas at may napadpad ditong isang sikat na trainer! Ah, marunong ka bang magsalita ng Filipino?" Yes! It would be nice if add it in your hack. "I don't speak english, I'm sorry..."
Patawad, hindi ako nag sasalita ng ingles. I've meant I'll insert the text soon, not release the first beta\demo that will be released when it's ready (probabilly september 2013, cuz after july I'll have a bit more time). That sounds cool, foreign languages in the game. You could try to let the game play voice samples [PCM], like Pikachu in Pokémon Yellow. But that would be very complicated to do. Cat333Pokémon and Koolboyman did it for their hack, Pokémon BW in GSC. Maybe, you can ask them for help with that. 1st - thank you for the over 3000 views! -All the trainers got a different overworld until I encounter a wild pokemon! How should I do if I want fiz all these bugs? You can't change the connection of one map just by editing a single byte, regularly. Normally when I happen to change connection data of some map, I first change the data to "nothing" (00 00 00...) and then start filling it up. I tried exchange the connections: left connection of Route 3 with left connection of Route 8, then right connection of Pewter with right connection of Saffron, most of the bugs are now fixed! But there's still a bug: the trainers' overworld is strange (rocket members & balls) & those overworlds are refreshed only when you open the menu or when you encounter a wild pokemon. We'll discuss about that weird bug later, when someone will know the reason why it's caused. Meanwhile, what do you think if I'll insert these two pokemon between the new ones? 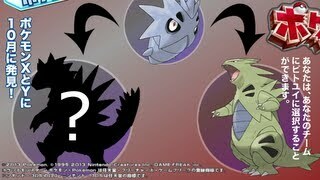 He's the alternative evolution of Pupitar, looks cool, huh? The new tree sprite is awesome, in my opinion is it more usseles for forest than route tree.